War veterans—who’ve seen more pain and devastation than most will see in a lifetime—struggle to find peace, and ways to fit back in and contribute all they have to offer. Three days on a roiling river bring them a step closer to feeling good in their own skin again. “Forward! Forward!! FORWARD!! !” shout the river guides. Eighteen US military veterans plunge their paddles into foaming waves. “Get DOWN!” comes the next command. Four gray rubber rafts pitch over the eight-foot drop at Clavey Falls. 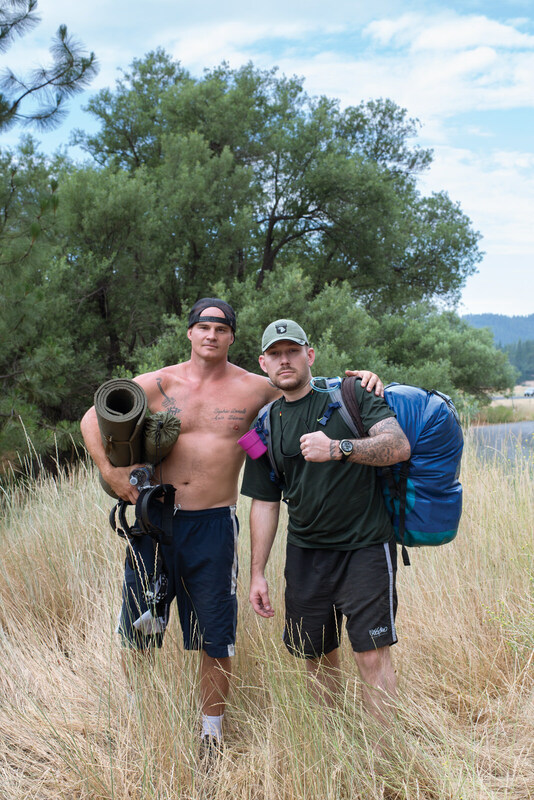 Matt Huffman (left) and Zeb Virgil (right) gear up for four days whitewater rafting on the Tuolumne River with their fellow veterans. 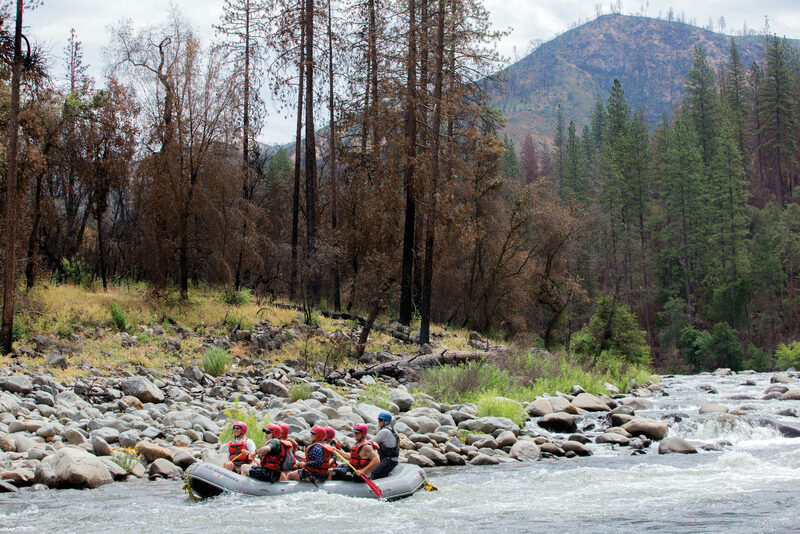 The veterans and their support staff of six guides and two mindfulness instructors are traveling 18 miles on a three-day journey through a wild, deep river canyon west of Yosemite National Park. They’re here thanks to a San Francisco-based program, Honoring the Path of the Warrior, which provides an unusual, highly skillful mix of free-of-charge, adrenaline-junkie fun with secular training in mindful breathing, acceptance, and compassion. This is HPW’s sixth whitewater trip. It has also sponsored rock-climbing and hiking events, so far serving more than 400 veterans. Several recent clinical studies suggest that training in mindfulness—nonjudgmental, accepting awareness—can help alleviate some of the symptoms of post-traumatic stress disorder (PTSD), which has grown to epidemic proportions among veterans of the Iraq and Afghanistan wars. Each week, roughly 1,000 veterans receive new diagnoses of PTSD, according to recent estimates from the Department of Veterans Affairs. Classic symptoms include depression, anxiety, irritability, and panic. The disorder is also a frequently cited factor in the alarming and increasing rate of suicides among US troops and veterans. Some 8,030 veterans committed suicide in 2010, the VA has reported— averaging out to 22 each day, and more in just one year than the total estimated number of US military deaths since the beginning of the Iraq and Afghanistan wars. Given their military background, most of the rafters are accustomed to ruggedness, risk, and danger. They also love to work in teams. It’s early July, and the banks of the Tuolumne are patched with charred remnants of buckeye, oak, and pine trees burned in last year’s devastating fire. The water is shallower than in past years, in the wake of a record-setting drought, although periodic releases from upstream reservoirs keep it flowing. Wearing bright orange plastic helmets and life vests, the vets stand out against the brown and gray of burnt grass and granite boulders. They listen for orders, poised to react, as if they were once again in training or combat. Many of the vets haven’t met each other before this week. Nor at first do they seem to have much in common. Five women and 13 men, they range in age from late 20s to early 50s. One is a university professor; another owns a small mechanics company. Some are back in school. Two are still employed in the armed forces. Several are out of work. They’ve served in the army, air force, navy, coast guard, and National Guard—in Iraq and Afghanistan, most recently, but also in Bosnia, Haiti, post-Katrina New Orleans, and as part of multinational forces in Israel. What brings them here and binds them together is soon obvious. All have been suffering—mostly alone—from a range of troubles including depression, anxiety, night terrors, and the aftermath of sexual assault. Many of these injuries date back to long before they signed up to serve, the military often seeming a safe haven from abusive families. It’s soon clear that they also miss the camaraderie and sense of purpose they had for a time and have since lost, but find again each time they reunite with other vets. As the vets journey through the wilderness, they learn to work through their life challenges in tandem with the obstacles they face among the rapids—and in frequent moments of silent contemplation. From left: Cheryl Wachenheim, Chris Fortin, Matt Huffman, Roger Chiprez, Danny Martinez. The two HPW instructors, Lesser and cofounder Chris Fortin, a Zen teacher and psychotherapist with a contagious high-pitched laugh, help the group work toward recovery with a daily routine that includes training in mindful breathing and instructions on nurturing compassion for themselves and each other. The vets, in turn, help each other, as they dare to be increasingly honest about their struggles and triumphs. The river journey reinforces everything they’re learning, meanwhile, with vivid sensory experience. The vets come to appreciate, for instance, that they can’t navigate whitewater while distracted by painful memories. While at first it may feel counterintuitive to lean forward into the waves, they find that, as in life, it helps them avoid getting thrown overboard. Boarding the raft Tuesday morning, the first day on the river, Danny Martinez, 28, mumbles that he’s sorry for the way his gym shorts keep slipping down his back. “They took away the string when I was in the psych ward,” he explains. Martinez enlisted in the army at 19, after dropping out of vocational school. He trained as a parachute rigger at Fort Bragg for three years, and then re-enlisted, after which he was deployed to Afghanistan. He lasted just one month there, however, before suffering a nervous breakdown. He missed home and dreaded getting caught in combat. This is Martinez’s second trip with HPW. His face is a mask of sorrow and he speaks only rarely, between heavy sighs. He says he has few friends and is battling drug addiction—both of which turn out to be common complaints among the rafters. Another veteran struggling with PTSD and haunting memories from Iraq says that on returning home, he drank a fifth of whiskey every night to numb his pain, until the morning he awoke to find three burns on his arm that he’d made with a fireplace poker. There was a rifle lying by his side. He believes he would have killed himself had the rifle not jammed. Several of the former soldiers are still coping with feelings of betrayal by partners in arms. Three of the five women rafters speak of being sexually assaulted by fellow soldiers and even designated superiors, crimes none of them ever reported. For Jose Arana, who joined the army at 17, fleeing an alcoholic stepfather who beat him, starting at age six, with “TV antennas, belts, boots, and baseball bats,” the hardest part about being in the military was coming back home. Last year, Arana abruptly took a leave from his US Postal Service job after arguing with his boss. His VA counselor recommended that he join an HPW river trip leaving two weeks later. “That was the start of my recovery,” Arana says. In Soul Repair: Recovery from Moral Injury After War, the author, Rev. Dr. Rita Nakashima Brock, describes the variety of psychic injuries lying behind the PTSD label, from having witnessed shocking suffering and death to feeling betrayed by colleagues and commanders to regret over having violated one’s own moral beliefs. Such wounds have been hard enough to bear in the wake of popular wars. But soldiers who’ve served in Iraq and Afghanistan—among the most controversial US conflicts in history—often come home to find themselves isolated from family and former friends who may neither understand nor care what they’ve endured. For them, the standard VA treatments—clinic visits and prescription drugs—may feel like flimsy Band-Aids. Many of them shun the VA altogether, for reasons some reveal on the river trip. Dawn Marie, the navy veteran, says at one point she was taking four different antidepressants every day, despite feeling “numb” and gaining 30 pounds. Given the alternative, who wouldn’t rather raft down a river? The physical exercise is invigorating, as is the companionship, while the stigma of needing help is at a minimum. The whitewater adventure also bridges what might otherwise be an insurmountable cultural divide between the gentle, politically liberal San Francisco Bay Area mindfulness teachers and the macho, mostly politically conservative men and women they’re trying to help. Forty-some years ago, Lesser, the HPW director, joined street protests against the Vietnam War. Back then, she says, she found it easy to vilify Americans who fought there, categorizing them as “a separate species” and judging their behavior “in the ridiculous hubris of thinking I’d never do such things.” Today, however, as a mother of young adults who under other circumstances might have wound up in Iraq or Afghanistan, it’s much easier for her to imagine and empathize with what the vets have endured. “The truth is I lose my temper with my kids, and if someone I loved were shot in front of me, I don’t know what I’d do—and I have a mindfulness practice of 40 years,” she says. Only later, says Fortin, did she come to appreciate the connection with her own family history. She believes her father, a World War II combat veteran who earned a Bronze Star, suffered from PTSD, although he never spoke of his experiences. The cultural divide has two sides, to be sure. National Guard Major Cheryl Wachenheim, who teaches agribusiness at North Dakota State University, was so worried that the fare on the river would be vegetarian (it wasn’t) that she ate 18 link sausages for breakfast at her hotel on the morning before joining the trip. After nervously driving on highways alongside Priuses with Obama bumper stickers, Wachenheim was relieved to meet other vets—some arriving in trucks and jeeps—who, as she describes it, became a safe haven from her fearful stereotype of California. After a couple hours on the river, just past a Class IV rapids called Gray’s Grindstone, Noah Nash, a guide from the All-Outdoors rafting company leading the trip, offers Danny Martinez a turn at the helm of the “oar raft,” where the helmsman is responsible for most of the navigation. Martinez moves to the back of the boat. He looks briefly alarmed as Nash hands over the heavy oars, with one nearly slipping from his grip. But he’s muscular and learns quickly, and is soon confidently steering the boat through small waves. The vets on the other boats watch and cheer him on. Martinez’s sad face is transformed by a grin. Matt Huffman, whose burly right arm is tattooed with a bracelet of skulls and the motto, “GOD HATES A COWARD,” is leading a meditation exercise. It’s Wednesday morning, the second day on the river. The group is camped out on the shore for the day, awaiting the next scheduled release of water that will once again make the Tuolumne navigable. That core of resilience may help explain how Huffman managed to go straight after hitting a low in 2010. Arrested for stealing a car, he wound up in county jail, where, after fighting and telling off the guards, he was placed in solitary confinement for two weeks. Huffman attended an HPW rock-climbing event on the advice of his VA counselor. He thought the mindfulness part was silly at first. But as he continued to practice, he realized he’d discovered a balance he’d sought for years as he’d tried, and failed, to mediate between the high of meth and the low of alcohol. Lesser and Fortin noticed his increasing dedication and eloquence, and persuaded him to enroll in HPW’s eight-month veteran leadership program. Subsequently, they chose him to be one of three vet leaders for the river retreat, where he skillfully encourages his fellow travelers to open up with the example of his own rigorous honesty. A pair of yellow-and-black swallowtail butterflies flit past, but most of the vets don’t see them. Eyes shut, they’re dutifully following Huffman’s directions, splashing the imaginary water over their chests. “I love you, man!” Jose Arana shouts when he finishes. “Where’d you learn that, Dude?” calls out Aaron Tozier, who served in Iraq from 2005–6. Mindfulness masters and philosophers have relied on flowing-water metaphors for millennia. Both the Buddha and Heraclitus compared life to an ever-changing river, both vexing and lovely in its impermanence. Throughout the three days of the river journey, Lesser and Fortin and their vet leaders draw frequent parallels between the rafters’ experience on the water and the challenges they face in their lives, encouraging them to face both experiences with the tools of drawing their awareness to their physical sensations, and taking that extra breath. Dawn Marie, also a vet leader, like Huffman, tells how the mindfulness skills the vets call their “toolbox” helped her the day she arrived at the campsite. She survived colon cancer a few years ago, requiring a colostomy. She also has a weak knee from a snowboarding accident that was compounded by the wear and tear of climbing stairs on her navy ship. Despite the big blue disabled-parking sticker on her dashboard, a man outside the restaurant in a nearby town where she’d stopped to buy a cup of coffee told her to park in a lot from which she would have to walk upstairs. Just a few days before the vets began their river trip, University of Virginia and Harvard researchers reported a new study suggesting that many people would prefer to administer painful electric shocks to themselves rather than spend time alone with their thoughts. This group wouldn’t seem to be an exception. The Tuolumne journey features several Class IV rapids in addition to the Class V rapids at Clavey Falls. (The International Scale of River Difficulty lists only six classes of rapids, with Class VI “rarely attempted.”) But the veterans on this trip are apparently not satisfied with this degree of risk. At one point, several of them, including Dawn Marie, with her colostomy bag and weak knee, head ashore to climb a 20-foot rock ledge from which they leap into the water. At another, they turn their rafts straight back into a rapid called Surf City, in a maneuver known as “surfing.” They appear undeterred by the guides’ warnings of the risks of falling out. And sure enough, as the tip of one boat flies up against a wave, Aaron Tozier topples into the water. All you see for one alarming instant is his bare foot in the air. All four rafts speed toward him at once, but it’s Danny Martinez who gets there first, throwing himself across his boat to grab Tozier and pull him up by his vest. Tozier is 6-foot-4; Martinez 5-foot-7. Martinez seems galvanized. Tozier’s leg is bleeding, and he has lost both of his shoes, but is otherwise unharmed. “I owe you one, man!” he shouts to Martinez, who grins his new grin once again. Scenes like this reveal the skillfulness of the adventure-and-emotional therapy formula offered by Lesser and Fortin, a combination that in past years, in different incarnations, has been used with troubled teenagers, and now is becoming increasingly popular for vets. It’s striking how the rafters snap back so quickly into working as a team, responding to orders and looking out for each other. Their bravery on the rafts also carries over to their group conversations, as, revealing their struggles, they repeatedly discover that they’re not alone. Wachenheim, the army reserve major from North Dakota, whom everyone, by now, is calling “Fargo,” speaks haltingly at first as she tells the group that the pine trees on the riverbank remind her of the beauty of Afghanistan. Baring her heart doesn’t come naturally; throughout the trip, she has preferred to crack jokes and splash other rafters with her paddle. At moments like these, the word “disorder” seems particularly wrong to describe what these veterans are experiencing. Their responses to what they have experienced instead appear abundantly human, which helps explain why many military leaders have recently begun to drop the “D” from PTSD. On Thursday, the group has to wait until after noon for the water release from upriver. There are nine more miles to go, including four more Class IV rapids, with names like Thread the Needle, Hell’s Kitchen, and Pinball. But in the last few miles of the journey, before the river widens at the opening to the Don Pedro Reservoir, the landscape looks a lot less charred. Drought-hardy chaparral shrubs and vines—manzanita and toyon, as well as poison oak and blackberry—make patches of green on the riverside. Dragonflies gleam above the water, and Nash, the guide, points out a bald eagle, sitting in a brand-new nest in a pine tree. The rafters spend the last night of their trip at a campsite near the tiny town of Groveland. Before getting into their cars to return home Friday morning, they stand, joined by Lesser and Fortin, in two lines that face each other. Many have tears in their eyes. The lines twist around so that each person gets a moment to look each other in the eyes. The vets take turns telling each other, “Thank you,” and “You’re welcome.” After just a few minutes, many dispense with the ritual and simply embrace. These past few days spent beyond the reach of cell phones, TV, and computers, have helped them listen to each other with rare attention. Lesser and Fortin take precautions so that after all this intense closeness, the vets aren’t left completely alone. They name pairs to be buddies to check in with each other, and remind them to keep appointments with psychotherapists. They announce a barbeque in San Francisco the following week, and more events, including veteran-leadership training, through the fall, seeking to build a community of war veterans supporting each other in their recovery. At the campsite, Lesser and Fortin also offer tips for re-entering daily life. “How many people here are feeling anxious?” Lesser asks them. More than a dozen hands are raised. Nearby, cars are revving their engines in the campground lots, reminding the vets of passing time, their own looming separation, and all the obligations, relationships, and emails awaiting them back home. Change is inevitable. Good times and bad times alike routinely transform into something else. And, just as on the river, the safest path forward is straight into the waves. Katherine Ellison is a Pulitzer-Prize-winning journalist and author of three books on ADHD, most recently including ADHD: What Everyone Needs to Know, written with Stephen Hinshaw, vice-chair for psychology at the University of California, San Francisco, and published in 2015 by Oxford University Press.